Lindiwe Zulu guest of the Italian company that built in South Africa the biggest solar park in the African continent. 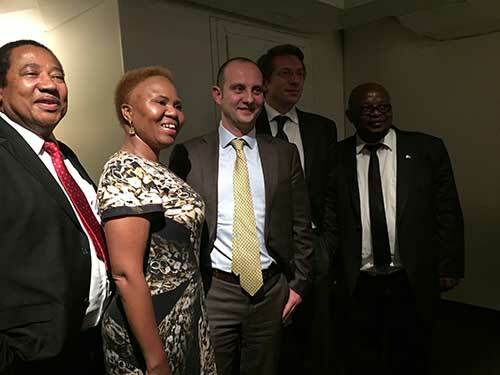 Milan, March 20th 2015 – Building Energy, Italian independent power producer from renewable sources, received the visit of Lindiwe Zulu, South African Minister of Small Business Development, at its headquarters in Milan. The meeting confirms the attention that the South African Government pays to the companies operating in their Country, such as Building Energy. Through its office in Cape Town, the Italian Group manages and coordinates the development and realization of more than 30 projects in South Africa and central Africa, among which the Kathu solar farm and the Mkuze biomass plant. In Kathu, in the Northern Cape, South Africa, Building Energy built an 81 MW photovoltaic plant, which has been operating since August 2014 and is now the biggest solar park in the continent. The company was also awarded the commission for the construction of a biomass plant with a capacity of 14 MW in Mkuze, the first and largest biomass plant in Africa. Moreover, in 2014, Building Energy took part in the fourth bid of the South African Government’s Renewable Energy Independent Power Producer Procurement Program (REIPPPP). Building Energy has recently been center stage in a number of exchange initiatives with the South African Government. In July 2014, the company supported the creation of a mural dedicated to Mandela in Milan, which was given by the municipality of Milan to the South African Government to celebrate twenty years of freedom and democracy in the Country. In October 2014, Building Energy took part in the first edition of the South Africa-Italy Summit organized in Cape Town by The European House – Ambrosetti. In May 2015, the company will be back in Cape Town as sponsor of the African Utility Week and Clean Power Africa, global conference and trade exhibition in the power and water utility industry. “As Minister of Small Business Development, I was inspired to hear about the good work being done by Building Energy in our country. I am confident that Building Energy will be able to contribute to our national effort to resolve the current energy challenge. We will continue to work with this company as we continue to create opportunities for small businesses. I will pay a special visit to the Kathu plant soon to see for myself the good work that Building Energy is doing,” said Minister Lindiwe Zulu. Building Energy is an independent producer of energy from renewable sources with a large portfolio of renewable plants in operation, construction and development, with a total pipeline in excess of 800MW in Europe, Africa, Central and North America and recently in MENA. In South Africa, Building Energy won the contract for the biggest photovoltaic project on the African continent – 81 MW in Kathu – in the first round of the REIPP, the South African government’s incentive program for the production of renewable energy. The PV plant has been operating since August 2014. For more information, visit: www.buildingenergy.it.